Faith Answers radio is a ministry of Colonial Oaks Baptist Church. The weekly broadcast features Dr. Gary Roy, along with co-host Lindy Rosenbaum, teaching and sharing God’s word so that listeners can grow closer in their walk with God. Each broadcast includes an invitation to receive Jesus Christ as Savior. We are honored to serve God and His people through the outreach of radio. You can listen to the broadcast each Saturday at 12noon and Sunday at 11am. Just go to letstalkfaith.com to hear messages from God's word. 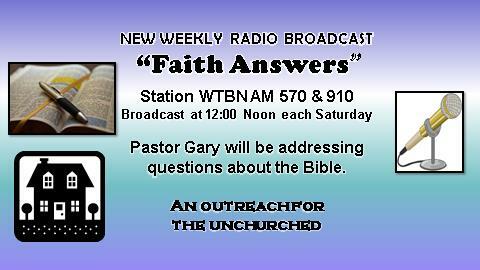 Your support of Faith Answers Radio is greatly appreciated.